Back at the First Notch! At Ft. McHenry in 2010. My spare tire is pretty much how it looked 30 days ago – and my Levi’s definitely weren’t buttoned at the waist! Having surpassed my goal of losing ten pounds (although I was absolutely coerced into breaking the rules on two occasions due to my kids’ daily needs LOL), I am unbelievably back at the first notch on my Levi’s belt which I’ve been wearing since a teenager… and the Levi’s are buttoned up at the top with room to spare. Incredible if I have to say so myself. Just kidding! That’s my oldest boy… and rather than blind you with a photo my daughter took of me on Day 0 of my actual gelatinous pale body, I think the point can be made differently. Besides, the photo at the very top pretty much shows what I looked like when I started without you getting blinded. So… Below is a photo of me in Tokyo at the Toyota School dormitory on a hot, humid August day, wearing my favorite Levi’s belt many decades ago. This was a couple of years after graduating from high school (19XXXXX BC). Then this week, I took a photo of the same infamous belt that I wear daily – and back at the very first notch! I even have my top waist button fastened and my shirt tucked it because my Levi’s were falling. They still fall. 🙂 But the belt’s battle scars clearly show how big my waist had been through the years. Overall, I’ve lost 31 inches as well, mostly off my spare tire and chest. I did drink copious amounts of Japanese green tea (the fountain of youth serum if you didn’t know) and water and ate lots of tofu. The times that “food” was beckoning me were when I’d prepare my kids’ meals being a single dad and from scratch. It was tough not tasting the food to correct the seasoning before plating it – beef stroganoff, spaghetti al limone, Maytag bleu cheese salad, classic pound cake and the like – but since the kids ate it all, it must have been just fine. Thanks to my coaches Marissa and Doug! Well written words addressing my disdain for our “paid for life with bebefits” politicians. One of my approved meals. Frankly, it was easy to prepare. I have been dieting for the past three weeks. Dieting for the first time in my life. I’ve always thought dieting was no big thing. But now, I’ve come to the realization that diet is a four letter word. Taken at the Yamato Museum in Kure, Japan, Nov. 2013 with my cousin Toshiro. I was near my peak weight then. Notice my Packers shirt, not my belly, please. 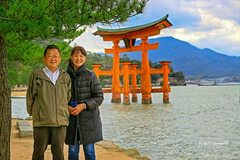 In 2012, my oldest son Takeshi (who is now pursuing a doctorate in physical therapy) and I ventured to Japan, mostly to vacation but also to take the ashes of our Aunt Shiz back home to Hiroshima. 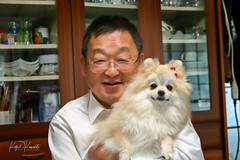 During our stay with our cousins, Masako always patted my stomach in fondness – implying I was Santa Claus. Yes, for only being 5’6″ tall, I was the jolliest in all of skinny Japan. I tipped the scales at 187 pounds. Japanese people were taking bets if I could squeeze through the train doors. My son, however, could probably lift the whole bullet train – with one arm. You should have seen the girls stare at him… Well, they were really staring at my belly. A recent pic of my oldest boy, Takeshi. Not one ounce of fat on him. I used to look like that, by the way. Can you guess which one is me? I’m on the right in the tall “geta”, or wooden sandals. I wore them to and from the tavern – drunk as a skunk and never tripped. Taken at the Toyota School dormitory in Tokyo. By the way, I was the arm wrestling champ at the school. Even kicked the teachers’ asses…but my son Takeshi laughs and still doesn’t believe me. Hmmph. I don’t think I heard him… Men suffer from bad hearing, you know. Long story short, about four weeks ago, my buddy invited me over to his beautiful home in Newport Beach for what I thought would be a cigar gig… Instead, there were nothing but lovely ladies there… There to learn about a dieting system. They described it as a way of life. Egads… Never did have that cigar. Well, two days later, I signed up for a 30-day plan with a goal of losing ten pounds. I was already down to 161 pounds – solely from cutting out breakfast burritos and enchiladas at lunch. I also lost some pounds from being on Leyte for six days in July. I started the 30-day plan on October 21st. It was a strict plan. Basically, only chicken, fish, turkey, green veggies, tofu, protein shakes and a potion that reminded me of Robitussin syrup of years ago. Yes, it disallowed everything I loved: salami, mayo, beef, pork, Parmesan Reggiano, chili tamales, fettuccine Alfredo… 😢 I realized determination was key… like resisting the two Pringles leftover in your kid’s lunchbox. My oldest daughter Robyn invited me over for Halloween, coinciding with her birthday. There were cheeseburgers, homemade tamales… and a chocolate mousse birthday cake. OMFG. But I resisted. I distanced myself from the deliciously smelling food by sitting against the walls. I even resisted the bite-size Milky Way bar my little granddaughter Emi was waving in my face as I took her trick or treating. Luckily, she dropped it somewhere along the way. I took my Little Cake Boss with her friend to In-n-Out on the fourth or fifth day of my diet. They both had Double-Doubles and those famous, wonderfully smelling, fresh French fries… but I didn’t even lick the wrappers. I wanted to but she told me I’d be embarrassing her in front of her friend if I did. And the toughest times were when the kids were with me; I had to cook breakfast, lunch and dinner for them. I didn’t even TASTE TEST the food before I plated it up because of my diet. It must have been OK since they ate my beef stroganoff, spaghetti al Limone, breakfast sandwiches before school, my famous pancakes from scratch smothered in real Grade A dark amber maple syrup with perfectly crisp BACON… I even baked a classic pound cake from scratch for Brooke to take to school. The results after three weeks? I guess it’s an OK result. BTW, can you see that belt in the picture with my schoolmates in Japan? I still wear that belt and it is on the first notch once again! Don’t worry. I won’t gross you out by posting a picture of my belt with my belly as a backdrop. Moral to story: Son, you have competition… but first, I’m hitting Tommy’s Burgers. It’s a mindset and with a little encouragement, you can attain your goals. The more immortalized flag was just hoisted in the background, with a few of the seven famous Marines still trying to secure it. The group of Marines in front have just lowered the first smaller flag that had been raised a bit earlier. February 23, 1945. USMC photo. I assume you know of the iconic flag raising atop Mt. 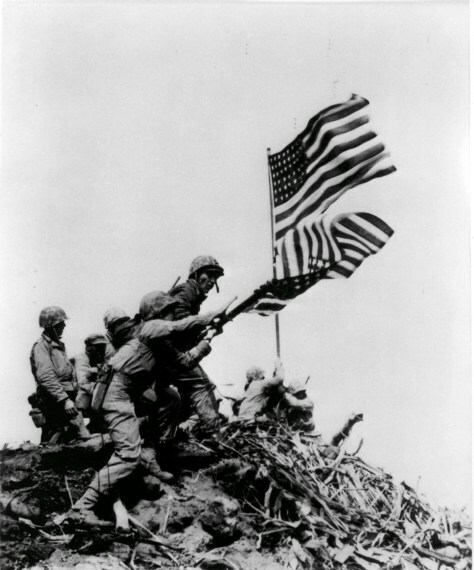 Suribachi by our courageous US Marines on Iwo Jima?¹ It was immortalized, in my opinion, by the most iconic photo of WWII. But did you know there were TWO flags? And that THREE cameramen were involved with capturing the two flag raisings? And did you ever wonder where the movie of the flag being raised came from…or who shot it?